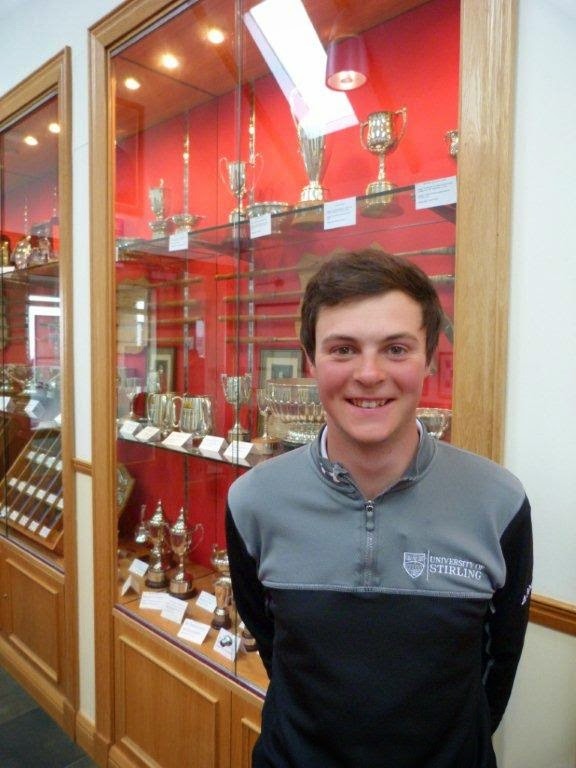 The 17th playing of Crail Golfing Society’s Battle Trophy tournament witnessed a shattering of the long standing Craighead Links course record by 21 year old Jack McDonald of Kilmarnock Barassie golf club. The previous record of 68 for the par 72 course was first broken by Jamie Savage of Cawdor golf club with a third round 65, but with an outstanding nine under par 63 in the fourth and final round, McDonald took the record with a flawless display of nine birdies and no dropped shots. Playing off a handicap of plus 4, Stirling University maths student McDonald took full advantage of the relatively benign conditions to produce his extraordinary round. The four round Battle Trophy was played last weekend (19/20 April), with the cream of Scottish amateur golf playing two rounds each day. The winner, Nick MacAndrew of Royal Aberdeen, finished on a two under par total of 286. McDonald finished two shots adrift in fourth place, having had a poor second round of 79. The Craighead Links course was designed by American course architect Gil Hanse, who is designing the course for the 2016 Olympics in Brazil. With a length of 6651 yards, the course has a standard scratch score of 74, two strokes higher than its par, indicating how tough it is. Opened in 1998, it is Crail Golfing Society’s second course, the first being the Tom Morris designed Balcomie Links, which opened in 1895. Crail Golfing Society is the seventh oldest golf club in the world.